The College Football Playoff (CFP) announced today that Sting and Lenny Kravitz will be the headline performers for its new signature musical event, AT&T Playoff Playlist Live!, the premier concert series at the American Airlines Center in Dallas during the weekend of the national championship. Kravitz will perform Saturday night, January 10. 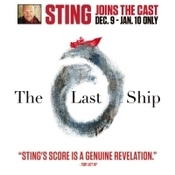 Sting will take the stage Sunday, January 11. One-day ticket prices for AT&T Playoff Playlist Live! are $30 for upper level and $41 for lower level. Two-day passes are also available at $46 for upper level and $60 for lower level. All tickets go on sale at noon Central time Tuesday, November 25, on on Ticketmaster (www.ticketmaster/attplayoffplaylist). For more information on the College Football Playoff National Championship weekend, please visit www.collegefootballplayoff.com. Join the conversation on Twitter about the event featuring @OfficialSting and @LennyKravitz using the official hashtag #CFBPlayoff.